Smartwatches enable rapid access to information anytime and anywhere. However, current smartwatch content navigation techniques, for panning and zooming, were directly adopted from those used on smartphones. These techniques are cumbersome when performed on small smartwatch screens and have not been evaluated for their support in mobility and encumbrance contexts (when the user's hands are busy). We studied the effect of mobility and encumbrance on common content navigation techniques and found a significant decrease in performance as the pace of mobility increases or when the user was encumbered with busy hands. Based on these initial findings, we proposed a design space which would improve efficiency when navigation techniques, such as panning and zooming, are employed in mobility contexts. 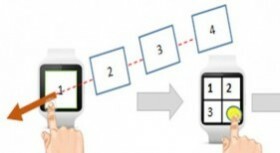 Our results reveal that our design space can effectively be used to create novel interaction techniques that improve smartwatch content navigation in mobility and encumbrance contexts. Download the D-SWIME: A Design Space for Smartwatch Interaction Techniques Supporting Mobility and Encumbrance video file.